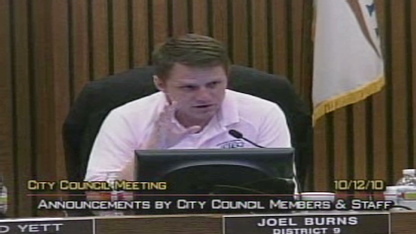 Fort Worth Texas Councilman Joel Burns’ videotaped story about being gay and bullied as a child recently went viral on the internet. Two out of three Americans believe gay people commit suicide at least partly because of messages coming out of churches and other places of worship, a survey released Thursday found. More than four out of 10 Americans say the message coming out of churches about gay people is negative, and about the same number say those messages contribute "a lot" to negative perceptions of gay and lesbian people. Catholics were the most critical of their own churches' messages on homosexuality, while white evangelical Christians gave their churches the highest grades, the survey found. The Public Religion Research Institute asked 1,017 Americans their views on religion and homosexuality between October 14 and 17, in the wake of a highly publicized rash of suicides by gay people. Gay rights campaigner Dan Savage said the idea that churches send out an anti-gay message "totally jibes with my experience and that of millions of other gay and lesbian people." He cited Joel Burns, a Forth Worth, Texas, city councilman whose emotional tale of being bullied as a young gay man went viral on the internet. "He remembers being told to go home and commit suicide and that he was going to hell," Savage said, adding that the source of such attitudes "wasn't in algebra." Leaders of the Christian right "have redefined Christianity so that it is about being anti-gay," he said. And he cited other poll findings that suggest more Americans than ever before define themselves as having no religion. "When you dig down, you found people who said they were Christians who didn't want to be identified with being anti-gay," he argued. But Jim Daly, the head of Focus on the Family, argued in a commentary for CNN that Christian churches are not to blame. "To violate the dignity of another person, in any form or fashion, is to contradict the very basis of Gospel-centered living. And to suggest that an orthodox understanding of Christianity encourages abuse against homosexuals is a sad misreading of the very tenets of the faith," he said. "Some self-described Christians do not act in Christ-like ways toward those who are different than they are," he conceded. "They save their harshest judgments for the sins they don't struggle with themselves. That is not biblical Christianity in practice," he said. Only five out of 100 people gave churches generally an A for their handling of "the issue of homosexuality" in the Public Religion Research Institute survey, while 28 percent said their own church handled it well. One in three people said that messages from places of worship contribute "a lot" to higher rates of suicide among gay and lesbian youth. Another one in three said they contribute "a little." Only one in five said they do not contribute at all. The rest said they did not know. Americans were equally split on whether homosexual relationships between adults are wrong, with 44 percent saying yes and 46 percent saying no. The sampling margin on the survey, a joint project of PRRI and Religion News Service, is plus or minus 3 percentage points. « Previous entryDebt worse than racism? This is not true!!! The church doesn't play apart in suicidals amongst the gays. We speak the truth;we speak out against may other things also. The church is there for everybody and it aids in a lot of matters. Believe it or not, the church accepts gay people into the church& every other person but we do not accept gay beliefs nor will we preach or teach beliefs outside of the bible.My church has a lot of people who are struggling with being gay & its their decision to change or not to change. Majority of them believe its wrong & they come to church to be delivered nobody forces any person to come to church.